There has been a lot of debate in the plumbing engineering community regarding the use of AC drives (or variable frequency drive, VFD) in domestic water pressure booster system applications. The debate centers on energy savings and whether or not there is a reasonable payback for building owners on the additional first cost of a variable speed system. This paper will shed some light on the issue, and perhaps provide design engineers with some tools to better understand when AC drives (AC drives) make sense. The purpose of applying AC drives in a pressure booster system is to allow constant pressure regulation without the need for pressure reducing valves. There are four key elements to consider in the application of AC drives. The first has to do with the nature of the plumbing system, the second with the sequencing, the third with selection of pumps and hydraulic efficiency, and the fourth with the nature of the end user's electrical service provider. Flow. The pressure booster must provide adequate flow under a wide range of demand conditions. Residual Pressure. This is the minimum pressure required at the most remote fixture in the plumbing system. Static Height. This is the elevation of the most remote fixture above the incoming supply main. Supply Pressure. The worst case pressure on the supply side from the municipality must be considered in calculations. This pressure should be taken after the water meter and backflow prevention device. These devices can reduce the incoming supply pressure by as much as 15psi. Losses. 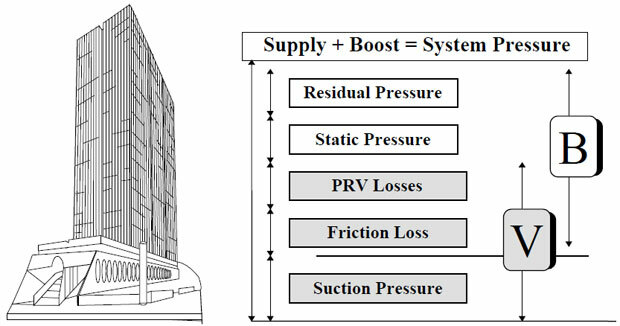 The friction loss calculation should include losses within the pressure booster system itself (typically about 5psi). Figure 1: The boost pressure is denoted by B and the variable pressures are denoted by V in the above illustration. The gray area is the opportunity for energy savings running a pump at variable speed in a domestic water boosting application. In analyzing the practicality of using AC drives, we must now consider which variations of the above parameters yield energy savings when varying the speed of the booster pumps. Of the above five factors, static height and residual pressure generally do not change. As such they will have little or no impact and hence will yield no opportunity to vary the speed of the pumps. 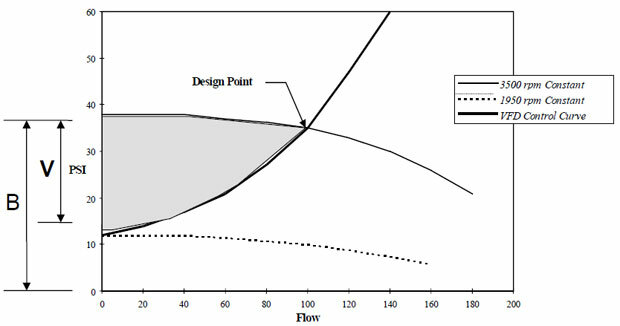 Variations in flow yield an opportunity for speed reduction since flow variations cause the pump to operate at different points on the pump curve. If the pump curve is steep, the opportunities for speed reduction and energy savings increase. Perhaps the greatest opportunity for energy savings is in the varying supply pressure. In some municipalities, this pressure can vary as much as 50psi due to daily peak demands or seasonal considerations such as irrigation in the summer. Finally, losses can potentially yield energy savings, as they are negligible at low flows. The additional pressure supplied for losses can be compensated for if the pressure sensor for the system is located remotely in the plumbing system. You will note that a constant speed pump will operate along the characteristic pump performance curve (upper curve) with the PRV limiting the pressure to the desired constant discharge pressure. The variable speed pump will operate along the system curve (lower curve) by varying the speed of the motor driver. Figure 2: Once again, the boost pressure is denoted by B and the variable pressures are denoted by V in the above single pump performance curve. The gray area is the opportunity for energy savings running a pump at variable speed. Clearly, there are a number of uncertain parameters in this formula. It is useful for analysis purposes to make assumptions to yield a quicker estimate of potential energy savings in the system. For illustration purposes, we will look at a single pump and system resistance curve to better understand the analysis of such a system. Further, for the purposes of simplicity, we need to make some assumptions before we begin our analysis. Load Profile (Q). This can be estimated in as much detail as desired. For the purposes of this article, we will look at an average building load assuming 50% of design flow for a single pump designed for 200gpm. The same analysis can be done using multiple pumps, multiple time increments, and average loads during those time increments to increase the accuracy of our results. Efficiency (η). Both pump and motor efficiencies at the average demand are assumed to be 65% and 85% respectively. Variable Pressure (ΔP). We will assume the variable pressure to be daily rather than seasonal. Seasonal variations will yield reduced savings since the high pressure is only experienced during a given period of the year. For the analysis, we will assume a boost pressure of 80psi with 10psi of losses, 10psi of supply pressure variation, and 10psi pressure rise to shutoff based on the pump curve. Thus, the total ΔP will be 30psi from zero flow to the design 200gpm. In addition to the above assumptions, we will approximate the variations in pressure across the operating conditions as being linear. At 100gpm, we can then assume the pump head to be 85psi, and the suction variation and friction losses to be 5psi each. As a further assumption, we must assume some loss in the VFD itself. For the purpose of simplicity, we will approximate this at 3%. A savings of 32.5kWhrs per day is realized. At $0.10/kWhr, the daily savings for a building owner would be $3.25 yielding an annual energy savings of $1,186.25. The above analysis simply considers the operating conditions in the plumbing system and neglects one key feature of pressure boosters: pump sequencing or staging. The controls and data available when using AC drives can yield additional energy savings if applied intelligently. The key consideration in sequencing is maximizing pump efficiency. When AC drives are applied and pumps are sequenced based on a single parameter such as speed (as in the case of a system with a single variable speed pump and constant speed lag pumps), pumps operate anywhere on the curve with no opportunity for maximization of pump efficiency. The same is true of pressure, flow, or kW sequencing. Monitoring multiple parameters allows pumps to be sequenced based on the location on the pump curve. In this case pump efficiency can be maximized yielding additional savings. You will note that operating the same pump at 75% efficiency rather than 65% yields 15% in energy savings. In conventional, constant speed systems, it is common for a small lead "jockey pump" to be applied to operated during off-peak hours. This works well on constant speed systems, but presents a few problems in a variable speed system. This is inherently unstable and generally is not used. The instability is due to the PID for one VFD working against the PID in the other. One VFD speeds up while the other slows down - this is a cyclic effect and is difficult to control without dramatically reducing the system response time. The damping required in the PID leads to fluctuation in pressure actual pressure vs. the set point pressure. If the pumps are not equal and operating at the same speed, the pumps will operate on the curve at the point of intersection of the two pump curves. This is equivalent to a constant speed system operation and does not gain any energy savings other than that available in the PID (pressure regulation). What happens is that since the smaller pump has a steeper curve with higher shutoff head, when two pumps are running, the smaller pump runs at the end of it's curve (inefficient point) and the larger pump runs near shutoff to the left on the curve (another inefficient point). The above choices are further complicated by the problem of when to sequence pumps on and off. The decision to sequence pumps requires flow, differential pressure, and speed inputs with a complex algorithm to sequence optimally. This has not been demonstrated to work properly in application. Any sequencing algorithm based on single inputs such as pressure, speed, flow, or power consumption is flying blind – there is no way for the pump controller to know how efficiently the pumps are operating and what combination of pumps is the best choice. By sizing pumps equally, PID stability is easily achieved – the equal pumps perform at the same location on the pump curve. Combining this with a best operating point (BOP) sequencing algorithm, sequencing of pumps based on a location on the pump curve regardless of speed, pressure, and other system-related factors is possible. Clearly, there is a great opportunity for energy savings based best hydraulic performance considerations. This design principle also makes a system easily adjustable in the field under varying operating conditions. 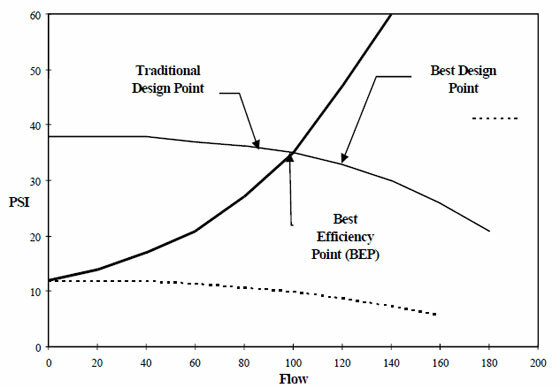 By convention, pumps are selected so that the design operating point is to the left of the best efficiency point (BEP). Let's examine why. Traditionally, pumps have been sized with additional pump head to ensure the needs of the system are met. In a traditional constant speed pressure-sequenced system, the second pump would be sequenced on (turned on) when the first pump begins to run to the right of the design point on the pump curve. This is due to the excess head in the initial calculations. Since there was no way to account for this pump head in application other than throttling of the pump, design yielded pumps which operate and are sequenced to the right of the best efficiency point. Figure 3: Traditional pump selection does not apply in variable speed pressure boosting if best operating point sequencing is applied. Designing to the right of the best efficiency point maximizes system hydraulic efficiency. If this same assumptions are applied in a flow-based (current, kW, or flow) or best operating point sequenced system, pumps never operated to the right of the design point. In fact, additional pumps are sequenced on just when the pump begins to perform efficiently. This means that the system runs more pumps than necessary, and that the pumps are operating at less efficient locations on the pump curve. With the above knowledge, it is clear that pumps in a flow-based or best operating point sequenced system should be selected to the right of the BEP. This strategy yields additional savings in two ways. The first is that the system will leave a single pump operating when it is close to its BEP maximizing pump efficiency. The second is that selection further to the right on the pump curve yields additional pump shutoff head. This increased shutoff head increases the "gray area" in the illustrations. The steeper rise to shutoff yields greater speed reductions at low flows, and consequently additional energy savings. The final consideration in the application of AC drives applies for any piece of mechanical equipment that uses an electric motor. Intuition and rudimentary economic theory support a model in which a commodity or service is bought and sold based on an agreed upon price. The total amount paid is proportional to the net amount of commodity or service provided. One apple is $1. Ten apples are $10. In a free market, the price will fluctuate based on the availability (supply) and the need (demand) for the commodity or service. The principle is very intuitive. The problem with the above model is that the bandwidth of the transaction or "delivery pipeline" is assumed to be infinite. If we apply a capacity constraint to the pipeline, the theory of supply and demand breaks down. Plenty of a particular commodity may be available, but the demand may remain unmet. Electric utilities have the pipeline problem. A customer's demand for increased bandwidth hurts the electric utility in two ways: it must increase the size of the pipeline (upgrade the distribution grid), and must produce more power to cover the higher theoretical peaks based on the increased bandwidth of the distribution grid. In theory, unused bandwidth is unusable to the utility. Further, unused bandwidth demands that the utility have enough power to handle the relatively rare case when the full capacity of the pipeline is needed. Electric utilities around the world use various strategies to deal with this very scenario. One means of managing the pipeline problem is to charge customers not for the amount of product used, but for the size of the pipeline required to deliver peak power to the customer. This has significant implications for application of electric motors. The starting current required to start a motor turning can be as high as 10 times the actual operational full load amps. It is this peak that the end user will pay for. By reducing the starting current, therefore, one can yield enormous savings for an end user. AC drives accomplish this task by soft-starting and soft-stopping motors. Inrush amps are drastically reduced, and in cases where the utility charges "pipeline penalties", energy bills for the entire building can be cut by as much as half by applying AC drives. Neighborhoods with varying supply pressures. Where the electric utility charges for daily or hourly peak power rather than for cumulative power consumption. Further to energy considerations, AC drives may be applied to solve other problems in a system such as water hammer or excessive maintenance of pressure reducing valves. Other considerations aside, the key factors to consider are variable pressure in the system, load profile, pump selection, and sequencing strategy. Variable speed systems will save energy in any application. Achieving a reasonable payback time for building owners is the key consideration. When these factors are considered, the payback can be significant.